Many fathers live a well-rounded healthy lifestyle with regular workouts that involve their kids. First-time dads who think a new baby will interfere with their exercise schedule need not sacrifice their workouts but do need to supplement their parenting skills to include exercising with their kids. The trick here is to come up with kid-friendly routines. These routines are equally rewarding and also help in establishing healthy habits among children. 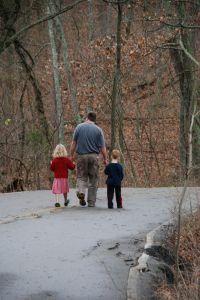 In an interview to the Associated Press, Heidi Hill, author of Fit Family: The Infant, Toddler and Preschool Years (Vitesse, 2008) explains how parents can hike, bike, run, and even kayak with their kids. Heidi and her husband, Tom have put this into practice by trying out many of these sports with their two daughters, aged 3 and 5 each. ”At the get-go, a lot of it can be miserable. You really have to persevere and know that you’re teaching a lifestyle.”, says Hill. In the beginning, dads could try to fast walk with a jog stroller or jog alongside their kids as they bike. The key lies in using the right equipment that is not too clunky. A trail-a-bike is a one-wheel option that can be attached to the back of dad’s bike. Workouts are a great way for dads to bond with their kids. As kids grow older, the positive effects of having family workouts increases exponentially. Dads need to listen to some good parenting advice by self-educating themselves and planning the workout in advance to make the experience fun for the entire family.